A number of haunting performances of Japanese culture and music mesmerised the audience at the Japan Festival 2018 at the Bangladesh Shilpakala Academy (BSA) in the capital on Saturday evening. For the first time after several years, the Embassy of Japan in Dhaka arranged the carnival to showcase traditional and contemporary Japanese culture and music here. More than 1,000 Bangladeshi people interested in Japan enjoyed the festival and immersed themselves into Japanese culture. The premises of the BSA turned festive and wore a splendid look for a few hours on the occasion of the Japanese festival. The presence of members of the Japanese community in their traditional look and the presentation of the Japanese tea ceremony turned the premises festal. The unique Japanese style of tea presentation overwhelmed the audience and that many were seen to sample the taste of the Japanese drink. ‘This was the first time for me to experience so many Japanese cultures at once,’ said Anika Begum who is majoring Japanese language at University of Dhaka. ‘I attended Japanese tea ceremony and thrilled to taste the tea which is a rare chance here in Dhaka,’ she added. Three renowned Japanese musicians— Sumie Kaneko, Shunsuke Mizutani and Mae Watanabe—held the audience spellbound with their fabulous performances at the event. The Japanese artistes put life into the celebrations by showing their mettle in different artistic performances on stage. They could bring additional excitement to the audience through performing Japanese pop songs and traditional music at the event. The Japanese prodigies earned a huge round of applaud from the beholders by sending waves of joy and ecstasy through the audience by their artistic flair. The knots of spectators also cheered the performers to the echo while they were rendering their spectacular performances. The audience also added an extra dimension to the programme with their energetic responses to the Japanese numbers with the sounds of Far East Asian instruments. Apart from the Japanese artistes, Sandhi, a young and talented Bangladeshi singer and music composer delighted audience by his exquisite performances at the event. 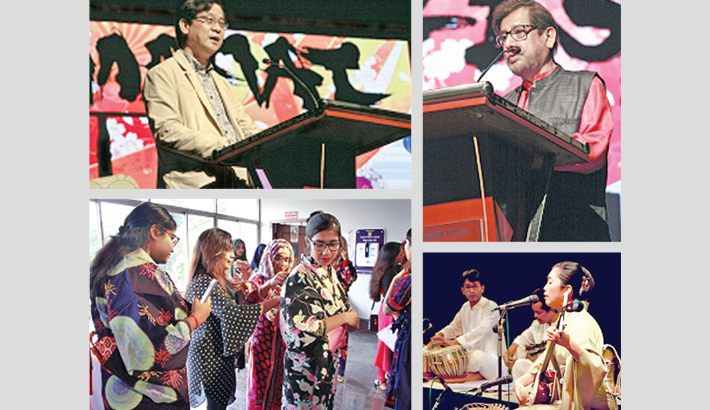 Cultural Affairs Minister Asaduzzaman Noor, Japanese Ambassador to Bangladesh Hiroyasu Izumi, and Director General of the BSA Liaquat Ali Lucky spoke on the occasion, among others. Japan and Bangladesh have established a long and friendly relation since 1972. The two friendly countries will celebrate the 50th anniversary of diplomatic relations in 2022. Japan will further strengthen the bilateral relations towards the anniversary. In terms of recent cultural and educational exchanges, Japan has provided its government scholarship for about 170 Bangladeshi students. Japan arranged many cultural events including Japanese film festival, Judo competition, Japanese speech contests, manga and anime workshop in Dhaka last year. The ‘Japan Fest 2018’ was organised to bring Japanese culture for Bangladeshi people at hand to further enhance amicable relations between the two countries. The event was supported by Japanese and Bangladeshi organisations: Regent Airways, Ajinomoto, Grameen UNIQLO, Honda Bangladesh, Studio Padma, Japanese Commerce & Industry Association in Dhaka, Bangladeshi Ikebana Association, Bangladesh Bonsai Association, ICARUS and students of Department of Japanese Language & Culture as well as Department of Japanese Studies, University of Dhaka. Japanese Koto & Shamisen Player, Singer Songwriter Sumie Kaneko has been recognised as a pioneer with her unique and chromatic use of the instruments. Bajna Beat is an active Dhaka-based Japanese music group formed by Shunsuke Mizutani and Mae Watanabe in 2017. The perfect harmony of Shunsuke’s piano performance and Mae’s amazing song has been well-received by Bangladeshi audiences. Sandhi began his music journey on the lap of his father who was a music teacher of Bangladesh Shishu Academy. He visited Fukuoka, Japan three times as a member of Bangladeshi delegate.